Feelings: After the much anticipated Alexander Wang sample sale, battling through crowds of half naked women trying on various dresses, we were ready for lunch. Torrisi, an authentic Italian-American joint, serves dinner with $50 prix fixe menu and hours of wait, but lunch is certainly more accessible and affordable. The only vegetarian option of the sandwich menu, potato, egg and provolone on hero ($10, $8 for rolls) was tasty and filling. There is nothing dainty about this sandwich. It was greasy and salty in a good way, and fresh ingredients really shined through. While I appreciated the sandwich, I missed more of delicate, clean flavors with artisan bread and pretty presentations. Torrisi is like a beautiful girl I knew in college-- every guy she was with ended up being gay after dating her. It seemed she was their last resort. "If I can't be turned on by her, it is 100% certain I am gay." If I cannot be turned on by this amazing Torrisi, my palate must really not be accustomed to Italian American cuisine. But if you grew up in New York, this will make you feel nostalgic for old New York. 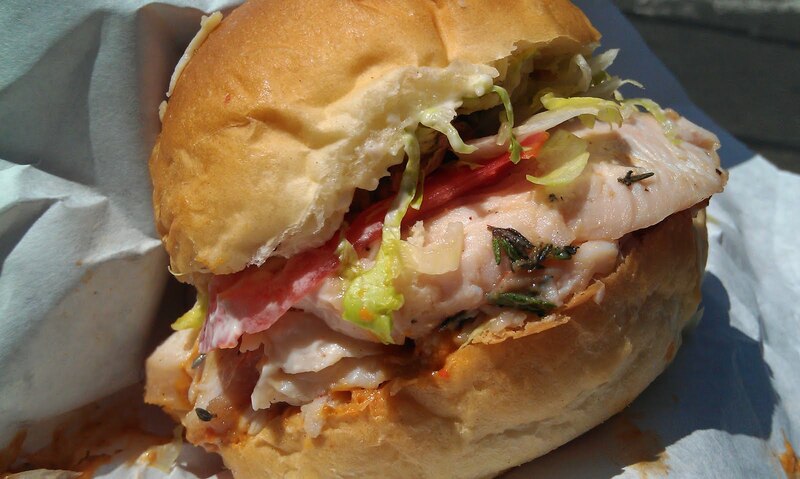 The tasty pictures above are RB's turkey sandwich, which he occasionally gets for lunch. He is a New Yorker to the core, and he sure knows his sammichs. 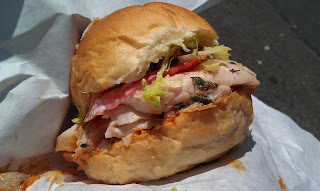 He refers to it as possibly the best turkey sandwich in town and highly recommends the spicy sauce. Overall, Torrisi lunch is cute and flavorful, and most people will agree that they serve a delicious sandwich. I unfortunately have tried one of the best sandwiches in town and have realized I'm playing on the wrong team. love this post! I'm a New Yorker through and through- the Chicken Parm sandwich is exactly what it should be, even the old school bread with sesame seeds on top. While the sandwich is not anything more than a basic chicken parm, it satisfies the craving. However, the sauce they use is beyond delicious! Thanks!! I wish I could enjoy it more! Loved the school girl analogy. After reading the post and Sara's comment, I'm really curious about the sandwiches. You def have to go for their dinner too!